Improved Split View, drag and drop between apps, and dare we say windows? How Apple could make iOS a productivity powerhouse. The future of iOS is bright. While I love my Mac and expect to be using the Mac for a long time yet, iOS is the Apple operating system for the next 30 years. As I described last week, there are many different directions iOS can go in, taking the platform beyond the size and shape of today’s iPhone, iPad, Apple TV, and Apple Watch. I believe that iOS’s future is big–and I mean that literally. 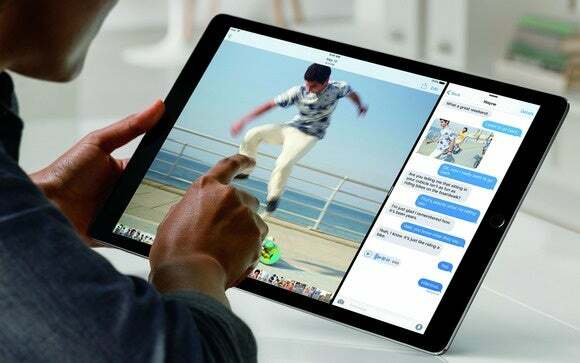 The 12.9-inch iPad Pro I’m using to write this article is currently the largest iOS device in existence, but it seems inevitable that Apple will want to size up iOS even more, whether it’s in a 15- or 17-inch mega-tablet, or an even larger desktop iOS device similar to the style of Microsoft’s Surface Studio. Not the most efficient use of space. Recent versions of iOS have counteracted this feeling by allowing the iPad to run more than one app on screen simultaneously. It’s a good start, and while it’s a bit tight when you run two apps on the 9.7-inch iPad Pro, on the 12.9-inch model it seems perfectly natural. Three apps at once. I don’t think I’d like to frequently work with three apps open at one time, but on the larger iPad Pro in landscape orientation, it would absolutely work. I’ve certainly found myself running two apps in Split View and wishing that I could use Slide Over for a third app. And the larger the screen, the less ridiculous a three-way split sounds. Split View could use more options for app sizes and placement. Improved Split View. The Split View feature introduced in iOS 9 is great, but it’s really Apple’s first take on the feature–and there’s more that could be done. The multitasking app picker is terrible, and should be the first to go. I’d also like it if the interface to quickly switch apps on both sides of the split was parallel–right now you can multi-finger swipe on the left side as you can with regular apps, but on the right side you need to swipe from the top of the screen to get to the picker. Drag and Drop. Do I even need to say it? 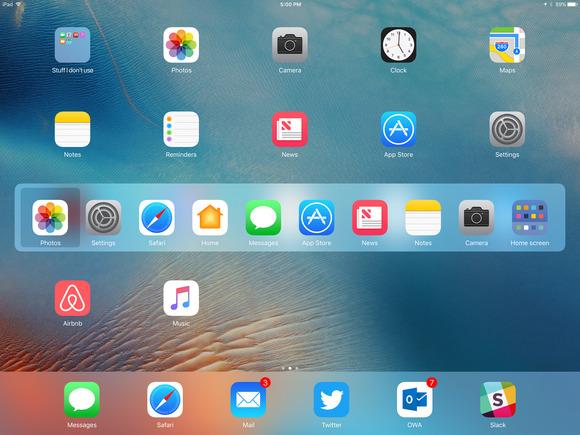 It’s the missing piece of iPad multitasking, and that’s been clear since day one. Here’s hoping that Apple introduces Drag and Drop between apps in Split View and Slide Over in the next major update to iOS. You can Command-Tab between apps in iOS 10 using the Smart Keyboard, but a more Mission Control-like view that gave previews of the apps would be better. Mission Control for iPad. An easier way to think of improving multitasking on iOS is to consider Mission Control on the Mac. Yes, iPad users can four-finger swipe left and right to change apps, which is similar to how it works on the Mac. Rather than a stack of cards, I’d like the iOS app switcher to display a zoomed-out view, more like what happens when you pinch closed a Safari window. That view could also be used as an interface for doing other advanced multitasking things like collecting pairs of Split View apps together and letting you switch between them with just a few gestures. 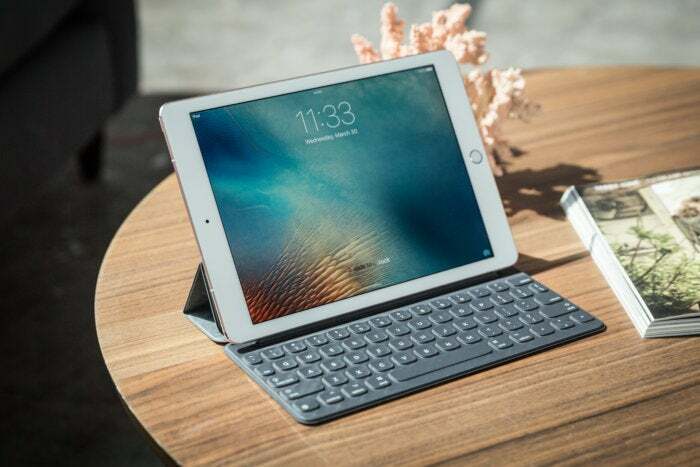 By itself, adding a keyboard doesn’t seem like it would be a major boost to iPad productivity, but have you seen how large the software keyboard is on the iPad Pro? Don’t get me wrong, I love it–it’s the best iOS software keyboard by far–but it takes up an enormous portion of the screen. Making it easier for iOS users to use keyboards is great for typing, but it’s also great for the device itself–because it gets to claw back millions of pixels for use by apps. The Smart Keyboard isn’t really sturdy enough for use on your lap, for starters. App tabs. This might not work on ultra-large screens, but I think it could work on devices like the iPad Pro. Sometimes you need to work with a bunch of apps at once, but you don’t need them all to be visible at the same time. So why not let multiple apps run simultaneously in a tabbed interface? It’s a metaphor that’s been with us for some time, and people seem to both like it and understand it. 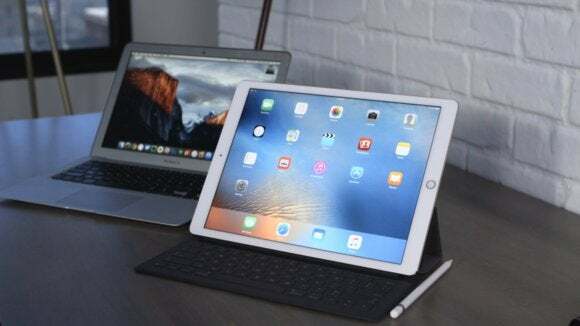 If your usual day of iPad use revolves around five different apps, why not put them all in tabs at the top of the screen and switch among them with ease? Windowing. On a larger screen, beyond the size of the iPad Pro, it’s worth considering putting apps inside windows. I realize this sounds like heresy, but hear me out: Picture a 27-inch iPad Studio. I know a lot of laptop people who love running apps full screen, but I can’t imagine running many full-screen apps on my 5K iMac screen–it’s just too big. Only Photoshop, Logic, and Final Cut Pro manage to take up my entire iMac screen–the rest of the time, I’ve got many apps open at once. So how do you run several apps at once on a very large screen? You could tile them, sure, but above a certain number that gets really complex, and tiles are not friendly to the squishy humans who tend to use computers. Placing windows in arbitrary locations on a computer screen allows us to get everything just how we want it, even if that opinion changes on a minute by minute basis. Still, I’m not advocating for free-form windowing as we see it on the Mac. Instead, picture app windows that could be sized in a limited set of ways. You don’t even need to imagine this–just grab an iPad Pro and play with Split View. Apps can run in full screen, share the screen 50/50, or share with the left app open on two-thirds of the screen with the right app taking up the other third. (Slide Over is that same one-third size.) Apps get a little bigger on the iPhone 7 Plus and a little smaller on the iPhone SE, and likewise on the smaller and larger iPads. A free-floating app on a large iPad screen would have a huge number of possible sizes and shapes, even using only the sizes currently in use across iOS.